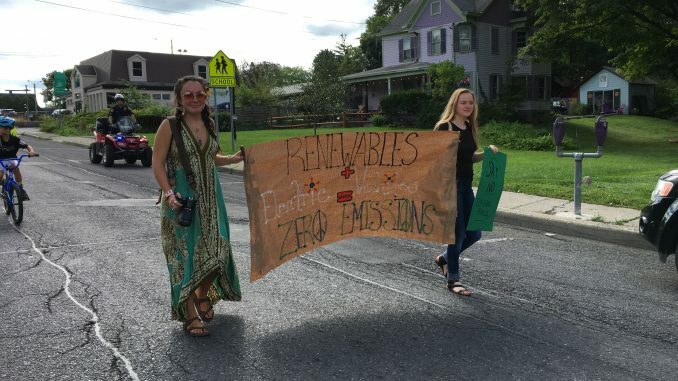 The parade was filled with chants of “WHAT DO WE WANT?” “CLEAN AIR!” “WHEN DO WE WANT IT?” “NOW!” Posters, signs, banners and smiles brought out the New Paltz community and led them to Village Hall for the Green Vendor Fair. Once there, the crowd was greeted by the New Paltz Dance Team, another few numbers by Tin Horn Uprising and some influential speakers. Iris Marie Bloom, a representative from New Paltz Climate Action Coalition, first introduced Mayor Tim Rogers to speak. He spoke on recent projects the Town of New Paltz was able to accomplish through the groups and people involved, some of these being rallying against the Pilgrim Pipeline, installing an EV charging station at Village Hall, passing the resolution to get rid of plastic straws and reconstructing the water and sewage infrastructure in New Paltz. Rogers said fixing the water and sewage systems is essential because if not, nutrient rich rain water would overflow into rivers and streets. Particularly this past week with all the rainfall, conditions would have been as bad as if we were down south closer to the hurricane. Fixing this problem is hard enough without the effects of climate change, but that is unfortunately not the case. Rogers emphasized the importance of reducing our carbon footprint and choosing to go on foot or on bike, just as he does at any opportunity that he can. Among the other speakers were New Paltz Supervisor Neil Bettez, Rosendale Councilwoman and Citizens for Local Power leader Jen Metzger, Ulster County Legislator and Catskill Mountainkeeper Senior Research Director Kathy Nolan, Ulster County Executive Mike Hein, and New Paltz Climate Action Coalition leaders Samrat Pathania and Janelle Peotter. More of the coalition’s work include educating people on energy efficiency and conservation through efforts such as insulating their homes, subscribing to community solar energy and switching to EVs. They hold public events with the aim to make people more comfortable with technology. The more educated and comfortable people are on energy efficient technology and how to use it, the more receptive they are to such efforts and compliant to bringing them to fruition. At the fair itself, there were vendors who provided solar power and affordable energy to homes such as Central Hudson, Lotus Energy and Sun Power, groups that advocated for positive environmental legislation. Local car dealerships like Friendly Honda, Kingston Nissan (https://www.kingstonnissan.net) and Healey Brothers. The Chevrolet EVs were available for test drives, as well as the GenZe electric scooter. For more information on the New Paltz Climate Action Coalition and their mission, visit their website, newpaltzclimateaction.org.